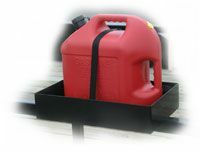 Holds one 5-Gallon or two 2.5-Gallon rectangler polymer cans. Open or Enclosed Trailer Type. Includes mounting hardware and strap to secure can(s).